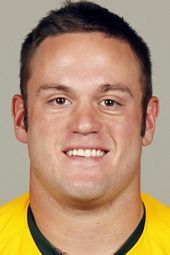 Baylor senior catcher Josh Ludy (Portland, Ind.) has all the makings of being the team MVP for a 2012 Bears team that has yet to lose in the Big 12 (18-0; no previous conference team had started better than 7-0 in Big 12 history), as part of the 24-game, school-record winning streak that ended a couple weeks ago. Baylor entered the season on the fringe of the top-25 rankings, but the Big 12 leaders now find themselves firmly in the race to earn one of the top-8 national seeds in the NCAA Tournament. Ludy fittingly became the first college baseball player to participate in a Skype video interview with College Baseball 360 (links below, followed by more bio. info). Ludy’s stellar two-way play has been a constant this season. The cleanup hitter leads the team not only in power numbers (7 home runs, 48 RBI and a .578 slugging pct. – but also in batting average (.370) and total hits (57). His combined “free passes” (25; 20 walks + 5 hit-by-pitch) nearly match his strikeout total (27), great numbers for a cleanup hitter – as is his ratio of only four Ks per home run (especially considering the scaled-back bats). Those offensive numbers tell only half the story, as Ludy has started behind the plate in 93% (41-44) of the games this season for the 36-8 Bears while directing a veteran pitching staff that has compiled its own impressive season stats: 3.27 team ERA … .242 opponent batting avg. … 2.2 K-to-walk ratio … and only 3.2 walks per nine innings. 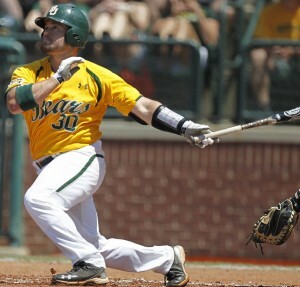 Ludy epitomizes a Baylor team that lacks big draft prospects but has plenty of veteran leaders. Eight position players returned from the 2011 team while the pitching side of the team features four seniors (including Ludy, along with weekend starters Trent Blank and Joey Hainsfurther, plus midweek starter Tyler Bremmer). En route to earning the CB360 Primetime Player of the Week honor (for April 16-22), Ludy hit .533 (8-for-15) during Baylor’s unbeaten week, highlighted by a sweep of the showdown series with cb360 #8 Texas A&M (5-3, 1-0, 7-5; gm-1 at A&M, gms 2 & 3 in Waco). He registered two hits in every game of the A&M series, with his most noteworthy moment coming on a 2-run home run in the 1st inning of the series finale. Ludy amazingly fouled off 10 straight pitches before driving the 14th pitch of the at-bat over the fence in left-center. Later in that series-sweeping win, Ludy’s 6th-inning double helped recharge a Baylor offense that had lost the lead and gone 14 straight batters without a man on-base (he came around to score the tying run). Earlier in the tense game-2, he provided two of his team’s six hits in that 1-0 thriller, after going 2-for-4 with a walk in the series opener. As the somewhat unsung director of Baylor’s stellar pitching success, Ludy helped guide a Bears staff – led by top starters Josh Turley and Blank, along with closer Max Garner (who saved all three wins vs. A&M) – that allowed only three earned runs in the entire “Battle of the Brazos” rivalry series. The Baylor pitchers walked only two batters over the 27 pressure-packed innings vs. the Aggies, with 18 strikeouts. Ludy also helped beat Texas A&M Corpus Christi midweek but sat out the other win over the Islanders, marking only the third time he has not been the Baylor signalcaller all season. He is riding a career-best, 10-game hitting streak and is one of only six players ever to be named Big 12 Conference player of the week on consecutive weeks. One week earlier, Ludy blasted three home runs in the series finale at Kansas State (sparking a comeback and yielding him 11 RBI for the series, a Big 12 record).